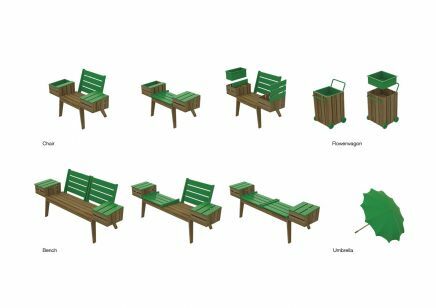 This series of garden furniture “Green fingers” creates an opportunity for elderly people to make garden work and at the same time be in contact with nature. It is very healthy to interact with nature since it evolutionary speaking is the environment that we are made to live in. Furthermore fresh air has a great impact on both health and spirit. Another important fact is self-determination. The project gives elderly the choice to become independent; therefore they feel in control instead of becoming a victim. 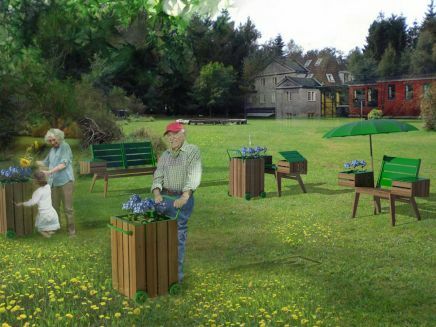 When people grow old it can be difficult to handle garden work because of physical disabilities; therefore this project integrates a chair with a flowerbed so it is possible to sit down and take care of flowers and plants instead of standing in awkward positions. In addition, there is a storage room in the armrest that makes it possible to have the garden-tools and the newspaper nearby. As an extension of the series there is made a raised flowerbed on vehicles that makes it practical to move the flowers around in the garden, and moreover to push it in front of you if you want to weed the little garden. As a positive result the elderly can sit in a suitable work height.